The new dating analysis suggests the "Peking Man" fossils, unearthed in the caves of Zhoukoudian are some 750,000 years old. The discovery should help define a more accurate timeline for early humans arriving in North-East Asia. A US-Chinese team of researchers has published its findings in the prestigious journal Nature. The cave system of Zhoukoudian, near Beijing, is one of the most important Palaeolithic sites in the world. Between 1921 and 1966, archaeologists working at the site unearthed tens of thousands of stone tools and hundreds of fragmentary remains from about 40 early humans. Palaeontologists later assigned these members of the human lineage to the species Homo erectus. The pre-war Peking Man fossils vanished in 1941 whilst being transported to the US for safekeeping. Luckily, the palaeontologist Franz Weidenreich had made casts for researchers to study. Experts have tried various methods over the years to determine the age of the remains. 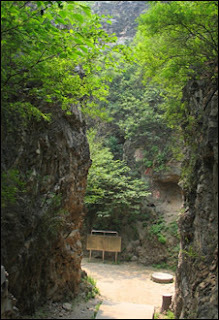 But they have been hampered by the lack of suitable techniques for dating cave deposits such as those at Zhoukoudian. Now, Guanjun Shen, from Nanjing Normal University in China, and colleagues have applied a relatively new method to the problem. This method is based on the radioactive decay of unstable forms, or isotopes, of the elements aluminium and beryllium in quartz grains. This enabled them to get a more precise age for the fossils. The results show the Peking Man fossils came from ground layers that were 680,000-780,000 years old, making them about 200,000 years older than had previously been believed. Comparisons with other sites show that Homo erectus survived successive warm and cold periods in northern Asia. Researchers Russell Ciochon and E Arthur Bettis III, from the University of Iowa, US, believe these climatic cycles may have caused the expansion of open habitats, such as grasslands and steppe. These environments would have been rich in mammals that could have been hunted or scavenged by early humans. Recent revised dates for other hominid occupation sites in North-East Asia show that human habitation of the region began about 1.3 million years ago. The Nature study forms an important addition to this work. 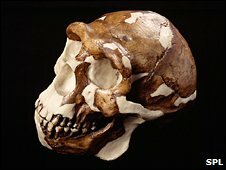 The Peking Man fossils are a vital component of the Out of Africa 1 migration theory, which proposes that Homo erectus first appeared in Africa around two million years ago before spreading north and east (modern humans, Homo sapiens, would follow much later and supplant all other Homo species). Evidence of the first dispersal comes from the site of Dmanisi in Georgia, where numerous hominid fossils dating to 1.75 million years ago have been unearthed. Finds from Java suggest early humans reached South-East Asia by 1.6 million years ago. The northern populations represented at Zhoukoudian were probably separated from southern populations represented on the island of Java by a zone of sub-tropical forest inhabited by the giant panda, orangutans, gibbons and a giant ape calledGigantopithecus. These early humans may have survived in island South-East Asia until 50,000 years ago. 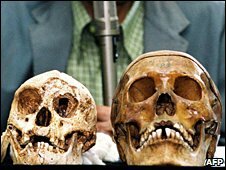 Recent discoveries suggest that on the Indonesian island of Flores,Homo erectus, or another early human species, became isolated and evolved into a dwarf species called Homo floresiensis, nicknamed "The Hobbit". It is not clear whether H. erectus ever reached Europe; the earliest European fossils have been assigned to the species Homo antecessor. But this classification is disputed, and some researchers believe the Spanish antecessor fossils do indeed belong with H. erectus.